Linden Lab has announced that its now going to be moving into the enterprise 3D collaboration space. It recently announced a new product called "Immersive Workspaces" which is basically an area in Second Life set aside for corporate meetings. That more secure area represents "a completely exclusive and secure experience, with no connectivity to the Second Life mainland." Their intent is to develop a complete collaboration experience for the enterprise. I guess that is Linden Lab's attempt to try and ensure that business meetings are not disrupted by griefers or by unwelcome barrages of flying penises. Looks like the enterprise virtual worlds space is getting a bit more crowded. It will be interesting to see how this all plays out. Better avatars for Cobalt are almost ready! Here is a video showing an early test implementation of a motion-cycle enhanced avatar in Cobalt. Peter Moore has been doing a wonderful job with this and in getting the Ogre3D XML importer to work with models developed in Maya or exported from Blender. That means that we will all soon have at least two art paths for getting avatars and other animated meshes into Cobalt worlds. It'll also be great to finally retire the stilted Alice and Rabbit avatars. This particular video also provides a sneak peak at some of the texture and environmental/directional lighting work that I hope to have make its way into the next update of the Cobalt code-base. to make a dual boot, Linux/Windows, version of the XO laptop. In addition, our intention is to engage one or more third parties to port Sugar to run on Windows in order to reach a wider installed base of laptops. In the meanwhile, OLPC remains fully committed to our goal: a completely free and open learning platform for the world's children. The mission statement of OLPC has not changed in three years. Sugar is the first user interface specifically designed for children and teachers to learn and collaborate, and remains central to our strategy. Broadening Sugar's reach to as many children as possible remains key to OLPC's mission. To enable the Sugar environment to reach as many children as possible, particularly in the poorest areas of the world, OLPC must be able to bid on educational technology contracts, some of which require that Microsoft Windows be able to run on our hardware. The increased volumes will lower the XO-1's price, already lowest in the industry with capabilities no other laptop shares. OLPC is substantially increasing its engineering resources and all software development continues entirely on GNU/Linux. We will continue to work to make Sugar on Linux the best possible platform for education and to invest in our expanding Linux deployments in Peru, Uruguay, Mexico and elsewhere. No OLPC resources are going to porting Sugar to Microsoft Windows, although as a free software project, we encourage others to do so. The Sugar user interface is already available for Fedora, Debian and Ubuntu Linux distributions, greatly broadening Sugar's reach to the millions of existing Linux systems. We continue to solicit help from the free software community in these efforts. Additionally, the Fedora, Debian and Ubuntu software environments run on the XO-1, adding support for tens of thousands of free software applications. For more information, see http://wiki.laptop.org/go/AnnounceFAQ. This reimagining of the real world can go only so far, given current limitations on the growth of Linden Lab's server farm, the amount of bandwidth available to stream data to users, and the power of the graphics card in the average PC. According to [Cory] Ondrejka [Linden Lab's now former CTO], Linden Lab must purchase and install more than 120 servers every week to keep up with all the new members pouring into Second Life, who increase the computational load by creating new objects and demanding their own slices of land. Each server at Linden Lab supports one to four "regions," 65,536-square-meter chunks of the Second Life environment--establishing the base topography, storing and rendering all inanimate objects, animating avatars, running scripts, and the like. This architecture is what makes it next to impossible to imagine re-creating a full-scale earth within Second Life, even at a low level of detail. At one region per server, simulating just the 29.2 percent of the planet's surface that's dry land would require 2.3 billion servers and 150 dedicated nuclear power plants to keep them running. It's the kind of system that "doesn't scale well," to use the jargon of information technology. But then, Linden Lab's engineers never designed Second Life's back end to scale that way. Says Ondrejka, "We're not interested in 100 percent veracity or a true representation of static reality." Here is a clever video from Johnny Lee at Carnegie Mellon University showing how you can use a Nintendo Wii-mote and home-made infrared LED light pens to create a low cost multi-touch interactive whiteboard system. UNC's Jeff VanDrimmelen has recently begun exploring ways to integrate haptic technology with Croquet virtual worlds. Haptic technology allows simulations to convey information to users in the form of mechanical stimulation. Haptic devices typically transmit information in the form of vibrations or motions, thereby creating a sense of touching or feeling virtual objects. The main types of haptic devices are 1) tactile feedback devices (that generate resistance to user input movement) and force feedback devices (that generate movement back to the input device). The Novint Falcon device is a new haptic device developed for use as a gaming peripheral and input device. The user interacts with a small knob with three degrees of freedom in movement at the front of what is otherwise a stationary desktop device. The knob is attached to the main body via three multi-hinged and motorized arms. The step motors within the arms feel what the user is doing as well as apply forces back to the knob. Jeff recently posted this video about his earliest effort to integrate the Novint Falcon haptic device with Croquet technology. Croquet is written in Squeak, a modern open-source development environment for the classic Smalltalk-80 programming language (the first purely object-oriented language and environment). Squeak was used because Croquet required a number of capabilities that could only be provided by a true late bound, message sending language. Croquet's relationship to Squeak gives Croquet the property of a purely object-oriented system. This has allowed for some significant flexibility in the design and the nature of the protocols and architectures that have been developed for Croquet. An essential property of Squeak is its ability to keep the system running while testing and making changes. Squeak allows even major changes to be performed incrementally and within a mere fraction of a second. Another key feature is Squeak's generalized storage allocator and garbage collector that is efficient in real-time so that animations and dynamic media of many kinds can be played while the garbage collector is collecting. It also allows reshaping of objects to be done safely. This is important to the creation and delivery of media rich collaborative virtual environments. Early on in the project, a Java-based Croquet was considered. However, that approach was abandoned because Java lacks needed meta facilities. In many ways Squeak/Smalltalk is still far ahead of its successors in promoting a vision of an environment where everything is an object, and anything can change at run-time. This is an important property for virtual environments that are deeply flexible and modifiable as an immediate result of the actions people take within those environments. Still, the lack of significant corporate backing and marketing muscle behind Squeak/Smalltalk has meant that less capable technologies are the ones with which most of today's developers are most familiar. At sometime during the night of Monday, February 26, 2007 a group of republican Second Life users, some sporting "Bush '08" tags, vandalized the John Edwards Second Life HQ. Though amusing to some, this type of activity underscores the need for secure virtual spaces - not just spaces where anyone, dressed up as anything they wish, can go anywhere and do anything they want. Restrictions based on identity or group affiliation are particularly important for serious simulation-based educational and research environments. Click here for a more detailed view of the damage. In recent months, more and more people have been asking me how Croquet is different from Second Life - thanks to all the media buzz around Second Life. Let me break it down this way: Croquet, as a software development environment, is more extensible than the development environments used to create collaborative worlds such as those in Second Life, and before that the unified metaverse of ViOS. These early server-based commercial approaches to establishing large-scale metaverses do not create computational environments that users/programmers can actually control - instead they must rely on constrained server-based computational environments to capture eyeballs for a variety of schemes to derive revenue for those who run the servers. By contrast, Croquet makes it possible to develop any number of interlinked metaverses that can be deployed independently of a commercial authority or the constraints imposed by server-imposed resource limitations. The less cyberlibertarian of you may find value in the fact that Croquet can also be used by institutions to implement far more capable and flexible and controllable commercial systems than those of Second Life and before that ViOS. Croquet's users/developers may freely share, modify and view the source code of the entire system. Croquet is platform and device independent. Croquet provides a complete professional programming language, integrated development environment, and class library in every distributed, running participant’s copy. Croquet-based worlds can be updated while the system is live and running. Here is a video created by the Squeak-based Sophie-server project being done by a software architecture group at the University of Potsdam in Germany. It shows how a Sophie server-based technology can be used to enrich the way of reading books. Sophie Server is a server application providing functionality to be used through Sophie Author, Sophie Reader, or even a Web browser. Sophie Server provides a home for all Sophie Books that exist in a shared networked environment, allowing users to search for, access, and contribute to them. The Sophie project is funded by the Andrew W. Mellon Foundation. See my earlier post for more information on the project. As you can see in the video, Sophie is not just a tool to render traditional paper books for reading on a screen. Instead, the project goes way beyond the notion of eBooks by leveraging the deep interactive capabilities of your networked computer. Sophie is basically an easy-to-use digital media assembly tool which allows both you and others to combine images, text, video, and audio into a single multimedia document containing multiple layers of information. This approach promises to open up the world of multimedia authoring to a wide range of creative people. When giving demos, I'm often struck by how important it is for a good many people to see a full implementation of a graphically-rich Croquet environment. Apparently, it takes a built-out virtual space for many of them begin appreciating the potential of the underlying system. That's a shame, since the Croquet technology is not really about the content that you put into it. With the limited resources at our disposal, we've been focused on functionality rather than the eye candy. Still, graphical elements such as richly textured models and other content within virtual worlds are important because they are the first things that people see - and connect with. Some popular 3D worlds such as Second Life are perhaps not as much about the capabilities of their enabling technology as they are about enabling access to content and social presence. Like it or not, it is for the most part that graphical eye candy and elements of content that frame people's perception of the underlying technology. I consider such elements of any richly-rendered 3D world scene in Croquet to be merely content within a system having deep capabilities. Yet, the models and textures set the tone for the experience of discovering what Croquet is all about since they have the potential to provoke a deep emotional connection between the user and the simulation. When you think about it, the very best of the 2D web browser applications available today are of no value unless they are used as viewers of web content. In fact, regardless of how wonderful their inner workings, the best and worst of them would be of equally minor value to users. To date, many of the models and textures made available in the Croquet SDK were borrowed from the Alice project, other content was thrown into the distribution with little consideration of quality - after all, our efforts have been centered around improving the underlying technology and not the content. However, now that we are building the first open applications with Croquet, you will be seeing a lot more and different content as examples in the distribution. I believe that once users can access spaces that other users have built, then the quality of content accessible via Croquet worlds will increase greatly through the dynamics of social software systems. I'm hoping that readers of this blog would be interested in helping with this by making textured 3D content available to the Croquet project. Please email me if you are able and willing to create quality content and scenes that we could include as part of the next release of the Croquet SDK and future applications. Your participation in this exciting project would be most welcome. Interesting video of a Croquet-based implementation of Erno Rubik's Magic Cube puzzle. It's amazing what can be done with the Croquet development environment and a little creativity. For solutions to the dastardly 3x3x3 cube, see Dan Brown's nicely narrated two part tutorial: Part 1, Part 2. Yesterday's blog posting prompted me to once again make available (this time as an embedded video) this wonderful short film that was done for Red Hat by the folks at Capstrat, a strategic communications firm here in Raleigh, North Carolina. Last year, I had the opportunity to participate in the Metaverse Roadmapping Project. Sponsored by the Acceleration Studies Foundation (ASF) and its supporting partners, a group of distinguished industry leaders, technologists, analysts, and creatives were brought together at a summit in Palo Alto, California to provide insights and explore the virtual and 3D future of the World Wide Web in a first-of-its-kind cross-industry public foresight project. An overview of what resulted from this exercise can now be downloaded as the Metaverse Roadmap (MVR). The roadmap documents basically seek to define an anticipation horizon of ten years (to 2017), a “longer-term” speculation horizon of twenty years (to 2025), and a charter to discover early indicators of significant developments ahead. Its really a filtered amalgam of the many diverse points of view expressed by those who were invited to the summit in combination with the collected results of several public and expert surveys, a few workshops and roundtables at major U.S. conferences, social meetups, and information collected via a public wiki. The MVR comprises two documents, both are available at the MVR website. The first is a set of MVR Inputs which summarize key insights in 19 foresight categories. The second is a MVR Overview which synthesizes some (not all) of the MVR Inputs into a series of narratives to explain what the authors feel are important features of the change and opportunity ahead. The authors include John Smart (Acceleration Studies Foundation), Jamais Cascio (Open the Future), and Jerry Paffendorf (Electric Sheep Company). Perhaps Alan Kay is on the mark when he declares that "the best way to predict the future is to invent it." Another video from UBC of Tim Wang's integration of a Wii remote with an iMac running Croquet. Duke University recently made CIO Magazine's 2007 CIO 100 list for "IT departments that understand what makes their companies tick and IT leaders who can translate vision into reality." The award was specifically focused on the work done across our university to improve academic technology services. There are many very hard working people who are responsible for our inclusion in this list. It's most rewarding to work here at Duke with people that truly value innovation - and that have the courage, fortitude, and perseverance to make that innovation happen. You can read about the award here. A video of six kids collaboratively co-constructing a simulated colony on Mars using a Croquet-based EduSim 3D Smartboard application prototype running on both a networked smartboard and several personal computers. This work is being done by Rich White of the Greenbush Southeast Kansas Educational Service Center. I am told that the kids really engage with this. The SDK is Not an App! The Croquet SDK (software developer's kit) can be used to develop metaverse applications - though it is not an application in itself. It's intended as a resource for serious developers who wish to build collaborative metaverse applications for education, research, industry and entertainment. It delivers a foundational infrastructure for creating persistent, interconnected and collaborative 3D virtual worlds. The SDK is not an application in itself - any more than Java is an application (see my previous post on this). The examples included within the SDK should be thought of as working code and not as how-to's or applications in themselves. Still, I often get feedback from people that the user interface is too difficult or that the "application" doesn't make sense to non-developer end-users. One of the challenges we face with this project is that the graphically-interesting 3D user interface and textured 'environments' included as examples within the Croquet SDK provide many people with the incorrect impression that these are traditional and end-user-useable applications intended as alternatives to commercial production-quality metaverse environments (many of the same people would never think of providing a Java software developers kit to an end-user as a way of evaluating a potential Java-based application's usability). The Croquet SDK was released to make it possible for programmers to join forces to create compelling end-user applications. In my earlier posts, I talk about some of what is beginning to be created. There is much more in the pipeline and the members of the Croquet Consortium are now focused on building an open source 3D Croquet-space browser application based on the SDK. We are planning to have a version available in 2008. There's been a lot of talk recently about the need for virtual world interoperability. By that I mean the ability for a character in one virtual world system to be able to enter another virtual world system and carry with it certain attributes and capabilities. For example, my Second Life persona, Imortega Lungu, might wish to leave the realms of SL and enter Everquest II to trade in 3D models that were previously bought with Linden Dollars in SL. The prospect of such trans-world commerce is apparently capturing the imagination of representatives from several large corporations because of the sense that money can be made if player identity can move from one virtual world service to another. Exactly how that would work and how value could be captured by the creators of those worlds remains unclear - but it's an interesting notion nonetheless. This discussion is happening because today's virtual world technologies are for the most part a series of technologically-distinct walled gardens - a bit like Prodigy, Compuserve and AOL were before the advent of the web in the 80's and early 90's. The desire to have a single metaverse that binds together all of the emerging virtual world technologies is a dream shared by many. Such a unifying metaverse would be to 3D as the web was to 2D. It would also have the potential effect of rendering today's virtual world technologies obsolete in the way that early walled gardens were rendered obsolete by the emergence of NCSA's Mosaic web browser. The problem is that the equivalent of what Mosaic was to the web has yet to emerge for 3D virtual worlds. Until it does, there will be much talk around seeking interoperability, standardization, and integration of disparate virtual worlds. Unless there are good business cases for company's to let their virtual world users transcend the walls of their virtual walled gardens, there may be little progress toward the broad interoperability now being envisioned. Here is another video demo by the folks at the Greenbush EduSim Project. In it you will see a full-featured in-world browser in action along with several other functionalities of the system including copy/paste functionality and a fractal terrain generator that was developed at The University of Minnesota. Nice music. The EduSim 3D Smartboard Application is a very cool Croquet-based white board being developed by Rich White of the Greenbush Southeast Kansas Educational Service Center. It's designed to provide educators and students with a way of linking 3D activities across multiple white boards by leveraging many of Croquet's existing capabilities. Greenbush is working to ensure that The Edusim is being developed with resource packs for the K-12 classroom. This is exactly the type of application that Croquet technology was designed to make possible. Kudos to Rich for helping to bring Croquet to the next level. The video says it all. The production of simulation-based learning environments can be an incredibly expensive proposition. Some of my friends in the video game development business tell me that a typical lower quality video game that is designed for around forty hours of game-play will, at minimum, cost between $2-20M dollars to produce (the cost can be much greater for higher quality games). Now consider the potential costs of creating a high quality simulation-based learning environment that provides forty hours of instruction in the context of a richly rendered 3D virtual environment. It would seem that the production costs of high quality simulation-based learning environments might stand in the way of a future where students could learn and interact within detailed and highly functional online worlds. After all, there aren't many institutions that can afford to pay $2-20M for production of an entire online course that would need to support support forty hours of engaging contact with simulation-based content. Clark Aldrich's very informative blog on serious games and simulations recently listed the costs of producing simulation-based learning environments. What Clark's list really underscores is that any widespread use of simulation-based learning environments over multiple courses will be a costly proposition unless we can leverage a different set of dynamics for their construction. Simulation in which students make a series of decisions via a multiple choice interface to progress through and impact an event. 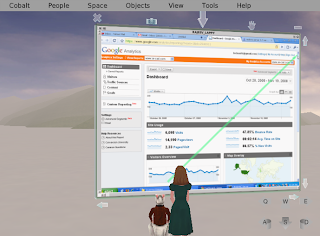 Simulation in which students typically try to impact critical metrics by allocating resources along competing categories and getting feedback of their decisions through graphs and charts. Small, easy-to-access game built to be simple and addictive, which often focuses on mastering an action and can provide awareness of more complicated issues. Can the dynamics of open source social software solve the problem of high cost simulation production for education? I think that it can. All we need is the right tools and the collective will to use them. After all, the MediaWiki-based Wikipedia doesn't cost anyone much money at all (in 2006, Wikipedia's Internet hosting costs came to $189,631). The cost of Wikipedia's real value - that of its content - has been distributed across its many contributors. What we need to solve the cost problem for simulation-based learning is a good 3D wiki-like technology that could be used to "evolve" multi-authored and highly functional simulation-based learning environments at low institutional cost. Space and place are really two very different concepts that are unfortunately often conflated by the designers of many of today's collaborative metaverses. Virtual spaces are representations of spaces in the real world, replete with mountains, trees, avatars, and other representations of real world artifacts. By contrast, virtual places are 3D user interfaces invested with meaning and function that need not be directly representational of anything in the real world. Open source software tools needed to create, deploy, and modify sophisticated and highly functional places are in increasing demand in education and industry. At the same time, design paradigms for such virtual places are still in their infancy. Problem is that we don't presently have very many good models for the utility of highly-flexible 3D environments in support of productivity. Until then, many designers rely on using today's online gaming and entertainment applications as the models upon which to build their ideas. Most of the current batch of early 3D educational and productivity support environments run the risk of becoming too representational and game-like than is warranted. An effective argument can be made that representational environments are appropriate in support of game-based learning. However, not all learning or productivity support need be game-based. This relevant link is from the YNNO Research blog in which YNNO researchers outline some very relevant differences between place and space that should be taken into account when designing collaborative 3D environments for work and education. YNNO, is a Dutch consultancy firm for innovative working which studies how innovation in workplace design, business process management and ICT tools can increase the productivity of today's knowledge workers. I am quite pleased to announce that Mark McCahill is leaving the University of Minnesota for a position here at Duke University as our architect of e-learning and collaborative systems! Mark has been developing and popularizing a number of Internet technologies since the late 1980s. He will bring to Duke the benefits of his deep background and rich experiences in collaborative systems development, large scale information system development and deployment, and 3D visualization. After receiving a bachelor's degree in chemistry at the University of Minnesota, Mark took a job doing analytical chemistry and analyzing the results on the campus mainframe. In 1989, Mark led a team at the University of Minnesota that developed one of the the first popular Internet e-mail clients (POPmail) for the Macintosh (and later the PC). In 1991, Mark led the original Internet Gopher development team and helped invent a simple way to navigate distributed information resources on the Internet. Internet Gopher's menu-based hypermedia paved the way for the popularization of the Web and was the de-facto standard for Internet information systems in the early-to-mid 1990s. 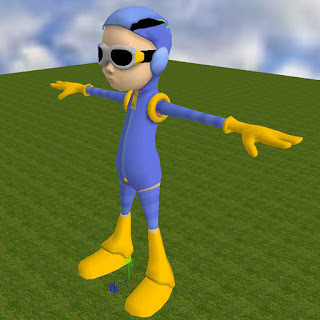 In 1994-95 Mark's team developed GopherVR, a 3D user interface to Internet Gopherspace. Working with other pioneers such as Tim Berners-Lee, Marc Andreessen, Alan Emtage and Peter J. Deutsch (creators of Archie) and Jon Postel, Mark was also involved in creating and codifing the standard for Uniform Resource Locators (URLs). Most recently Mark has served as one of the six principal architects of the Croquet project and was instrumental in founding the Croquet Consortium. I look forward to working closely with Mark as we apply the lessons learned from first generation Internet information systems to next generation collaborative systems including enterprise-integrated applications based on Croquet. In a recent Point of View article in The Chronicle Review, Cathy N. Davidson expresses her opinion on the Middlebury College History Department's recent snubbing of Wikipedia and why academic institutions can no longer ignore the changes that are being brought about by social software technologies and the types of creative dynamics they enable. The issues discussed in Cathy's piece have relevance to social collaborative tools such as wikis and the types of co-constructed knowledge spaces that Croquet-based educational environments make possible. Today's co-constructed 3D environments provide us with the potential to disseminate ideas as visual and dynamic objects in the way that text-based facts and ideas are constructed and disseminated via today's Wikipedia. This capability will have a profound effect on the academic world in that it has the potential to fundamentally change to how we communicate and learn. The changing legitimacy of Wikipedia is only the tip of the iceberg. The advent of social software and self-regulating large-scale group dynamics stands to challenge traditional models of instruction, authorship, copyright, and the value of static auteur-generated scholarly works. Back in the mid-1990s, while we were designing ViOS as a large-scale commercial server-dependent and massively-multiuser metaverse application, I was deeply concerned that its success as a widely-used platform would be its undoing. Thats because, unlike the web, multi-user immersive environments require relatively constant interactions between clients and servers - and those interactions don't scale well for large numbers of users. Virtual environments such as multi-user flight simulators and first-person shooters rely on many independent server sessions that are limited to a relatively few users at any one time. Massively multi-user metaverses, on the other hand, require the client to be updated as fast as things happen within the environment. This means that large-scale metaverses need a lot of horsepower in the server layer since every move and every action of every avatar must be conveyed to every client. This puts a tremendous load on a few servers for even the most trivial of interactions. The approach simply doesn't scale to support the widespread global information systems that the Croquet architecture is being designed to make possible. Our strategy back at ViOS, Inc. was to simply re-tune the system and put up more servers as the loads increased - hoping for the best. That approach would work well for Intranet applications that serviced relatively small numbers of clients. It even worked well for ViOS' initial user base of around 15,000 unique users. Problem was that once we had several thousand simultaneous Viosians tooling about in the landscape, they began to overload our interactivity servers, resulting in performance problems and service interruptions. Since there wasn't a lot of cash flow or investment capital during the 2001 post dot-com financial downdraft, we were unable to add servers at a rate that could meet the demand. If we had, it might have led to another few years of success for the ViOS metaverse platform - but sooner or later we would have been brought down by fundamental flaws in our approach as a bottlenecked client-server based architecture. The Croquet technology has been developed with these lessons in mind. It is designed to scale in support of interconnected multiverses of millions of users without the need for any dedicated server infrastructure. Croquet's architecture makes it possible to develop metaverse applications in which, anyone can freely put up content in islands of any size, interlink those islands with any number of other islands, and control access to those islands. By contrast Second Life makes money by controlling who can create islands and how those islands are linked to each other. It also has a very similar technical architecture to that of ViOS - a vintage twentieth century client-server architecture with with single points of failure, inertia, and control. It's been interesting to watch Linden Lab's struggle with the inevitable technical problems faced by Second Life as a result of its recent popularity, constrained architecture, and non-scaling technical approach. For details on some of those struggles click here, here, and here. For some time now, Laurence Rozier has been developing a message format that, among other things, can allow for interoperability between metaverse environments. Called Remote Actions Packets (RAP), it basically makes it possible for someone to do something in, say, Second Life and have that same action replicated in Croquet - and vice versa. RAP messages consist of an actor identifier, an action name, and an encoded list of stage directions. In this simple video, you will see a Croquet window (on the right) side by side with a Second Life window (on the left). Each shows a live running world containing a simple cube. When the cube in Second Life is clicked, a script runs that causes the cube to move. Almost immediately, you will see this action replicated in the Croquet world. Next, a Croquet menu select initiates a move of the cube in the Croquet window. After a short delay, the simple cube movement is mirrored in Second Life. The implications of Laurence's work are that Croquet worlds can now be made to mirror aspects of Second Life worlds - and vice versa. This also means that there's now a way by which actions taken within metaverses such as Croquet can be logged to text files. That particular capability would be of great importance to educators, researchers, and marketers who are interested in understanding what kinds of things have taken place in Croquet environments. Sophie is new open source Squeak Smalltalk-based software application for creating digital multimedia books that are easy to build. A product of the Institute for the Future of the Book, It is in essence a multimedia authoring system. Sophie-generated books can resemble regular books containing text and pictures, or they may also contain video, audio clips, images in a slide show, other books, links out to the web, and allow for reader interaction. Sound a lot like what the web was supposed to be? You bet. The difference is that Sophie has been developed as a tool to enable non-technical people to assemble digital documents without needing to learn complex computer languages or to rely on programmers. Still, Sophie uses a human-readable distributed XML format to ensure that a user's content remain accessible for decades to come. Should a particular title need features beyond those provided by Sophie (such as performance or databasing) there is little in the way of preventing those systems from being plugged in on a per book or per distribution basis. The intent of Sophie is to facilitate the shift from page to screen as a means of scholarly communication. Many academics find it difficult to move to the digital medium because of the technical barriers to doing so in a sophisticated manner. That has a lot to do with why the Research in Information Technology Program of the the Andrew W. Mellon Foundation and the University of Southern California School of Cinematic Arts chose to fund this project. Sophie is available here, and a video demo is here (the demo starts at: 23:32). Alan Kay was recently interviewed for CIO Insight magazine's Expert Voices feature. In this piece entitled Alan Kay: The PC Must Be Revamped—Now, Alan discusses the mindsets that stand in the way of real innovation - and what his not-for-profit VPRI is doing to address the issue. In the article, Alan defines Croquet as one of those efforts and as "a new way of doing an operating system, or as a layer over TCP/IP that automatically coordinates dynamic objects over the entire Internet in real time. This coordination is done efficiently enough so that people with just their computers, and no other central server, can work in the same virtual shared space in real time." Given the relative public silence around the Croquet project in recent months, I've been getting lots of emails asking about what's been happening since last Spring's Beta release. Well, there's been a lot going on. Several of us have been hard at work developing the foundations for a larger and more inclusive public effort around the project. With the transitioning to Croquet 1.0, we are in the process of setting up a not-for-profit corporation to house the open source project. The corporation will provide the governance structure required to ensure that continued development of the open source technology and that local Croquet development efforts receive the support they need from a self-sustaining and growing community of peers. On the technology side, there are many dedicated people who have also been hard at work debugging and hardening the system for its move out of Beta. For this, special thanks need to go to Howard Stearns, Mark P. McCahill and his team at Minnesota, David A. Smith, Andreas Raab, Joshua Gargus, Ed Boyce, and Dan Fakken, for doing what needed doing. We are now testing and working on documentation and our efforts are coming to a point where the silence will soon be broken. The version 1.0 release of the Croquet SDK is imminent! The upcoming version 1.0 release of Croquet has been code named "Hedgehog". I know that many of you have been waiting for news of its release date. The committee has been working hard to make it publicly available early this year - part of the reason that things have appeared so very quiet on the blogs and user's forum. The silence is the sound of intense work. We (actually mostly Andreas and David) are debugging the code and Mark and I are working with the Wisconsin and Minnesota teams to prepare a download package for eventual publication on the Croquet Project website. Many of these new features have already been discussed in papers presented at the OOPSLA 2005 conference. These topics will also be discussed by David Smith and Andreas Raab at the upcoming C5 conference to be held this week at Berkeley. The really good news is that all of these are functioning in the present snapshot. Now its a question of debugging. Want to make a floor? Well, then see #makeFloor:fileName: and it's callers for examples of making a floor. The photo is one that I took of the floor of the Sistine Chapel - one of the world's most under-appreciated works of art. In an online posting, the Brazilian programmer Américo Damasceno reminded me that the best way to learn something is to try and teach it. Américo certainly took this assertion to heart and decided that the best way for him to learn Croquet technology was to prepare a series of three of step-by-step online tutorials on Croquet and Squeak programming. The first of these is an Introduction to Basic Croquet Programming. The second is called Basic 3D Programming in Croquet. The third is a Step-by-Step Tutorial on Squeak 3.6. Please keep in mind that Américo's tutorials are based on the Jasmine developer's preview of Croquet and much of what they contain may not apply to v1.0 (which includes some very fundamental differences from the Jasmine developer's preview). Nonetheless, I direct people there since some programmers will unoubtedly find the tutorials very useful. Thanks to Américo for providing the emerging community with this valuable resource! Last October, Preston Austin and I gave a presentation on the Croquet Project at an event sponsored by Accelerate Madison, a premier Wisconsin-based networking and business support organization focused on information technology issues. Fortunately, the organizers arranged to record the entire presentation and make it available to anyone via Webcast. The Webcast includes the full program and presentation including video, audio and visual graphics. Its one of the only resources on the web that can provide you with view of Croquet technology in action. Click here to view the October 13th, 2005 presentation. The Devil Made Me, DoIT! I am pleased to announce that I have resigned my position as Assistant Director with UW-Madison's Division of Information Technology (DoIT) in order to accept the position of Assistant Vice President for Academic Services and Technology Support wth Duke University's Office of Information Technology. The Office of Information Technology (OIT) is the primary central infrastructure and service provider of information technologies for Duke University. The organization provides a broad range of services, spanning the areas of networking, telecommunications, central computing facilities, enterprise systems, education and research support, general computing support, and security. In this new position, I have broad responsibilities for Duke's academic and research computing development and support efforts as well as all customer service functions of Duke's Office of Information Technology. I will also be working with others on the Duke Digital Initiative (DDI), a major instructional technology program focused on experimentation, development, and implementation of digital technology in academic environments and will be seeking to build Duke University's capability to develop, deploy, and support Croquet-based solutions for higher education in partnership with the newly forming Croquet Consortium. I am jazzed about the possibilities! Each year, Alan Kay brings a group of people together at the Apple Hill Center for the Performing Arts in the beautiful mountains of southern New Hampshire. This three-day event in August provides invitees with an opportunity to spend quality time interacting with one another. The group includes technologists, designers, artists, musicians, in the tradition of other north-eastern creative retreats (Yaddo, etc.). The event also features great food and great music (by the Apple Hill Chamber Players). As I reflect back on my experiences at Apple Hill, I am struck by the deep importance of the contextualized social presence that occurs there and the positive effect that it has in support of creativity among the participants. Bringing people together in a way that allows serendipitous social interactions to take place is a wonderful way of stimulating collaborative creativity - and at Apple Hill, it really does work. There is lots of group interaction and lots of one-on-ones. Hopefully, Croquet will provide a technological framework for extending the value of such contextualized social presence into online spaces. The success of doing so depends on how well applications are designed and built on the core technology of the Croquet SDK. Until then, Apple Hill will have to do ;) . This year's event was particularly interesting because of the presence there of many folks who are working on hardware and software for Nicholas Negroponte's $100 Laptop Initiative and on the final stages of the Croquet 1.0 SDK. The Croquet development team at the University of Wisconsin is now beginning work on a six month pilot project to demonstrate instructional potential of a Croquet-based learning environment. The project involves partnering between our group and Michael Connors, a professor in the Department of Art at the UW School of Education, to develop authoring tools that allow the instructor to create an instructional environment to address critical barriers involved with the art critique process and provide students with means to upload, share, and critique their art projects within collaborative online spaces. The goals of critique in art are to remove individual perceptual barriers, develop an appreciation of how others perceive one's work, to overcome biases related to psycho-social conditioning, and develop skills of articulation and critical discourse. We are hoping that this project will lead to the development of generalized Croquet-based authoring tools that can be adapted to many different curricula, such as those in Law, Sociology, Psychology, Guidance, Business Management, Medicine, etc..